Bias correction is usually applied to climate model outputs before they are used as inputs to environmental models for impact studies. Every climate model is post-processed independently of others to account for biases originating from model structure and internal variability. To better understand the role of internal variability, multi-member ensembles (multiple runs of a single climate model, with identical forcing but different initial conditions) have now become common in the modeling community. Bias correcting such ensembles requires specific considerations. Correcting all members of such an ensemble independently would force all of them to the target distribution, thus removing the signature of natural variability over the calibration period. How this undesirable effect would propagate onto subsequent time periods is unknown. This study proposes three bias correction variants of a multi-member ensemble and compares their performances against an independent correction of each individual member of the ensemble. The comparison is based on precipitation and temperature, as well as on resulting streamflows simulated by a hydrological model. Two multi-member ensembles (5-member CanESM2 and 10-member CSIRO-MK3.6) were used for a subtropical monsoon watershed in China. The results show that all bias correction methods reduce precipitation and temperature biases for all ensemble members. As expected, independent correction reduces the spread of each ensemble over the calibration period. This is, however, followed by an overestimation of the spread over the subsequent validation period. Pooling all members to calculate common bias correction factors produces the best results over the calibration period; however, the difference among three bias correction variants becomes less clear over the validation period due to internal variability, and even less so when considering streamflows, as the impact model adds its own uncertainty. The online version of this article ( https://doi.org/10.1007/s10584-019-02393-x) contains supplementary material, which is available to authorized users. 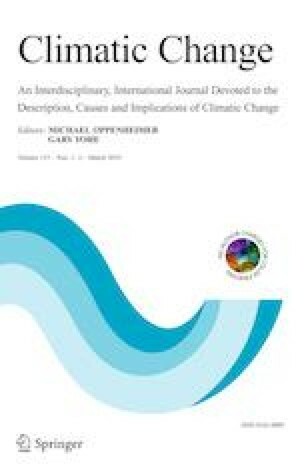 The authors would like to acknowledge the contribution of the World Climate Research Program Working Group on Coupled Modelling, and climate modeling groups for making available their respective CanESM2 and CSIRO-MK3.6 outputs. The authors wish to thank the China Meteorological Data Sharing Service System and the Bureau of Hydrology of the Changjiang Water Resources Commission for providing datasets for the Hanjiang River watershed. This work was partially supported by the National Key Research and Development Program of China (No. 2017YFA0603704), the National Natural Science Foundation of China (Grant Nos. 51779176, 51539009), the Overseas Expertise Introduction Project for Discipline Innovation (111 Project) funded by Ministry of Education and State Administration of Foreign Experts Affairs P.R. China (Grant No. B18037), and the Thousand Youth Talents Plan from the Organization Department of CCP Central Committee (Wuhan University, China).